Wild Geese are pleased to announce the addition of a new class to our already packed schedule. As of Saturday 5th November you have the opportunity to train under Anne Dempsey, a long time friend of the Wild Geese. Anne teaches Yoga, Somatics and Pilates which she blends together seamlessly into a fantastic method for opening the joints, loosening the muscles and strengthening the core. Unlike many Yoga teachers, Anne has little time for the wishy washy nonsense that often goes alongside her art and instead sticks plainly and simply to the stuff that works. Mixed Martial Arts is the fastest growing sport in the world, it’s popularity has spawned hundreds of MMA clubs, each churning out potential fighters. But are these fighters really ready? Training for MMA is a new art, few coaches really have the answers. This is reflected in the rate of injury we see amongst the more experienced MMA athletes. Knees, shoulders, backs, all damaged. Need this be the case? Is this the future for all who take up this excellent sport? Are all MMA fighters destined to be crippled with injury? We believe this does not have to be the case. Fighters and coaches just need the right tools in their tool box to help prepare bodies to become resistant and resilient to the rigours of the sport. And on September 24th, we aim to provide these tools. Wild Geese Martial Arts have lined up 4 great coaches, each with an excellent knowledge of the body and it’s workings to help provide some of this information. Paul is the founder of Wild Geese, a martial artist and world champion in his own right. He currently defies the odds as he continues to train and make improvements despite a seriously arthritic hip. His doctors are befuddled at how he is able to walk, never mind Squat heavy barbells, kick heavy bags and practice takedowns in Judo. 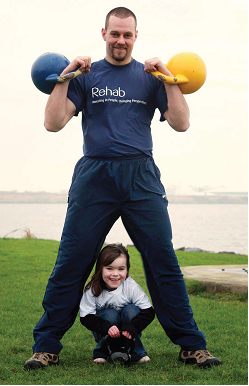 Paul says much of his success comes from the use of kettlebells. He will show how to keep the body strong and resilient, regardless of what happens to it. Co founder of Wild Geese, also a life long martial artist who has had his fair share of injuries. Dave has a huge knowledge of strength and conditioning techniques and hopes to show the difference between the Body Building style of training common in our gyms and an effective strength program for athletes. He’ll also teach some of the most effective bodyweight drills that can be used anywhere, without equipment, to forge a lean and powerful body. Mark is a Physiotherapist, Acupuncturist, Martial Artists and friend of Wild Geese. His insight into martial arts along with his insatiable thirst for knowledge has lead to Mark becoming one of the leading Physio’s in Ireland. He’s the first person we recommend when any of our members gets hurt. Mark will be talking about the body and how best to prevent and recuperate from injuries. Strength and flexibility are two sides of the same coin, you can’t have one without the other and remain an athletic and an effective fighter. Anne is a yoga instructor with a unique teaching style. She blends Somatics, which are excellent for prehab and rehab, Pilates for core strength and Yoga for flexibility, all which she teaches and demonstrates without any of the wishy washy nonsense usually associated with the art. All four instructors will be open for questions through the day. How to book: email info@wildgeesema.com, but do it soon, priority will be given to all who actively fight under the Wild Geese name, limited space is available for outside interest.